Today's Mars Photo is of Chasma Boreale, a long deep valley with walls that rise over 1400 meters (4600 feet) above the floor of the plain. 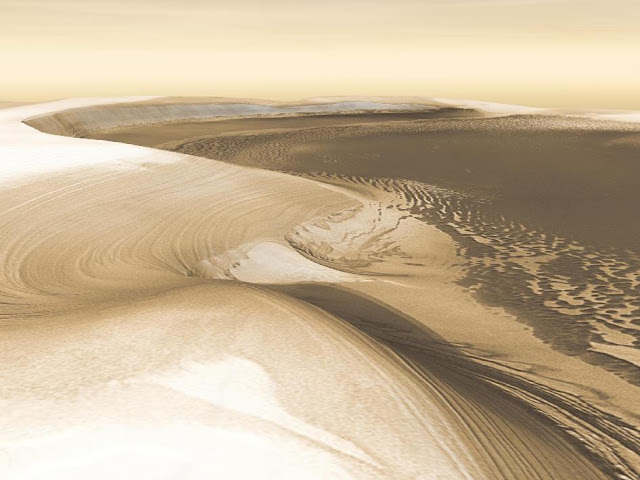 The valley cuts deep into the Mars' north polar ice cap. The large valley was once covered in ice, but the ice caps have since retreated. To see the original source for this image just click the image itself. This image combines photos taken from December 2002 to February 2005 by the Thermal Emission Imaging System instrument on NASA's Mars Odyssey Orbiter.